The first two are about as close as we can come to what we’ve seen described. The final three are just us playing around with colors and logos, there’s not any quotable data to back those ones up. Still going to be a while, but hey, at least you’ve got an idea of what we’re thinking. Oh, and by the way, The Creator mentioned “a different kind of helmet.” So feel free to let your mind run wild on what the heck that could possible mean. Recall one of the Adidas vids or a press release saying the new team will be “playing for the name across their chests.” Also I think the general trend is in jersey design is away from shoulder yokes, idk. This is a really good call. I’m going to keep that “name across the front of the chest” quote for future reference. The primarily steel gray looks better than I thought. I recall Gary Bettman saying there will be textures on the jerseys. I think it will look more like the Team North America jerseys. Adidas three stripes on the jersey? Notre Dame gold helmets or Tampa Bay Buccaneers pewter helmets? Gold chrome would be legit. not too bad at all. Hello Drew, didn’t know you had graphic skills. I feel the red band will be more prominent than what is shown here, but this is probably pretty close to what they will end up looking like. Glad you like the designs! 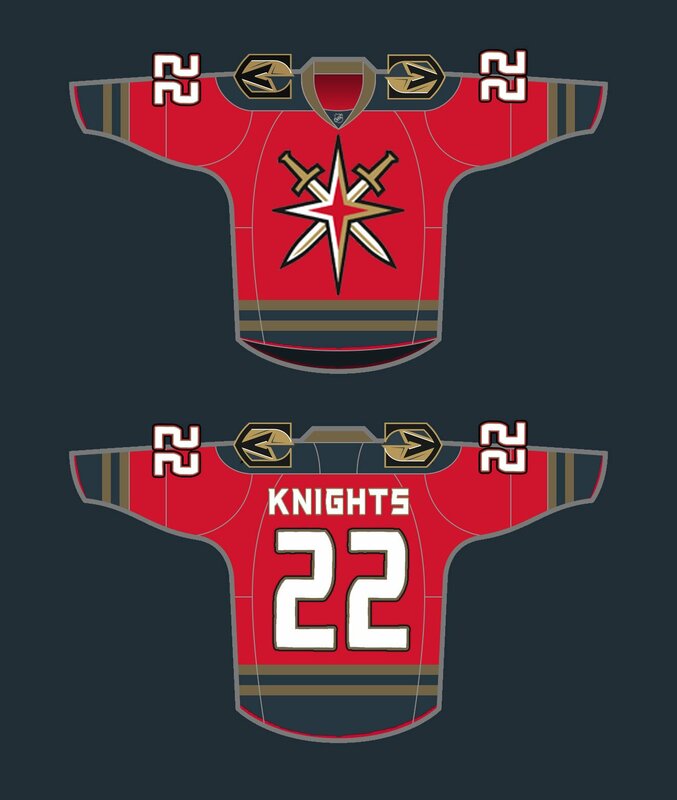 They could put the red band on TOP of the gold stripes to make it more prominent, but I tried to keep the striping from looking too much like the old Anaheim Ducks layout. 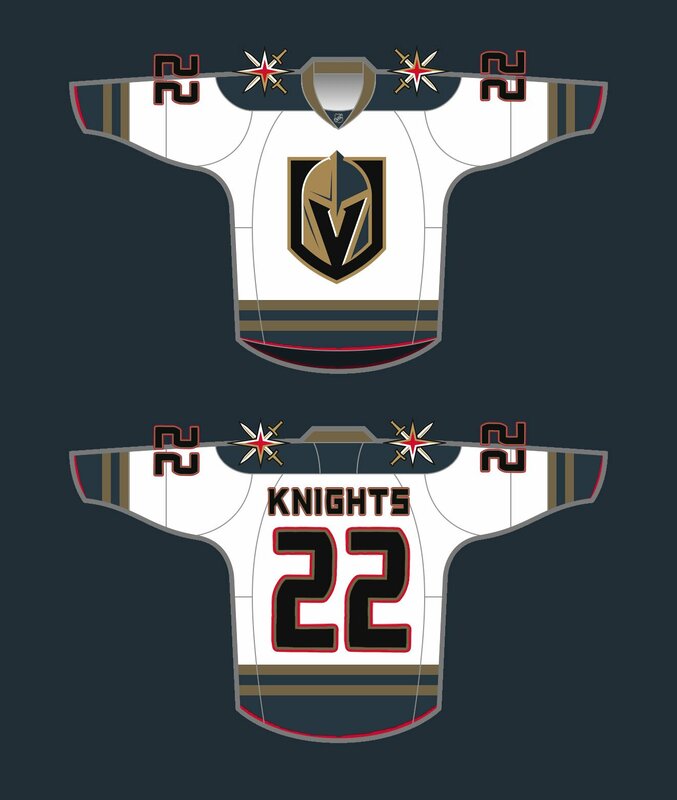 I also think that keeping it limited makes it pop and lets the gold provide more of the shining and bright contrast (I do think they’ll go with the reflective gold, not unlike what the Pittsburgh Penguins had on their jerseys during their “Vegas Gold” era). good stuff Drew. Miss you on the Panthers broadcasts btw. Bettencourt said the group learned of the NHL team’s name through media accounts Wednesday. “We’re reviewing the situation and figuring out what the way ahead would be,” she said. Bettencourt said the Army parachute team got the name because of its gold-winning performances in skydiving competitions around the world. “We understand that one of the Las Vegas team owners has Army connections, and will likely understand our interest in this announcement is meant to protect the proud history of the Army’s Golden Knights and their vital role in telling the Army story and connecting America with their Army,” Bettencourt said. I’ve got a Foley quote on this. Coming tomorrow. Foley did confirm another ESPN.com report that said the team needed to get the OK from Clarkson College and the University of Central Florida to use the Golden Knights nickname that both schools also use. Seems like Foley hasn’t done anything legally wrong, but it appears the Army parachute team aren’t too thrilled. Good lookin’ out. That quote will also be in the article. I would see why they talked to Clarkson and Central Florida, but not Army? Hmm, perhaps it eas kinda like when we were kids and we asked mom if we could do something but not dad because we already knew dad would say no? I’m just sayin…why didn’t they ask Army? Maybe because they knew they’d say no. They already did once. Not a huge fan of the name but I love the logo and the great potential for jerseys you guys have come up with. I understand his love of all things Army but I’m still surprised he went with a medieval theme with the Kings sure to be our primary rival. I hate the fact that Knights are subservient to Kings. 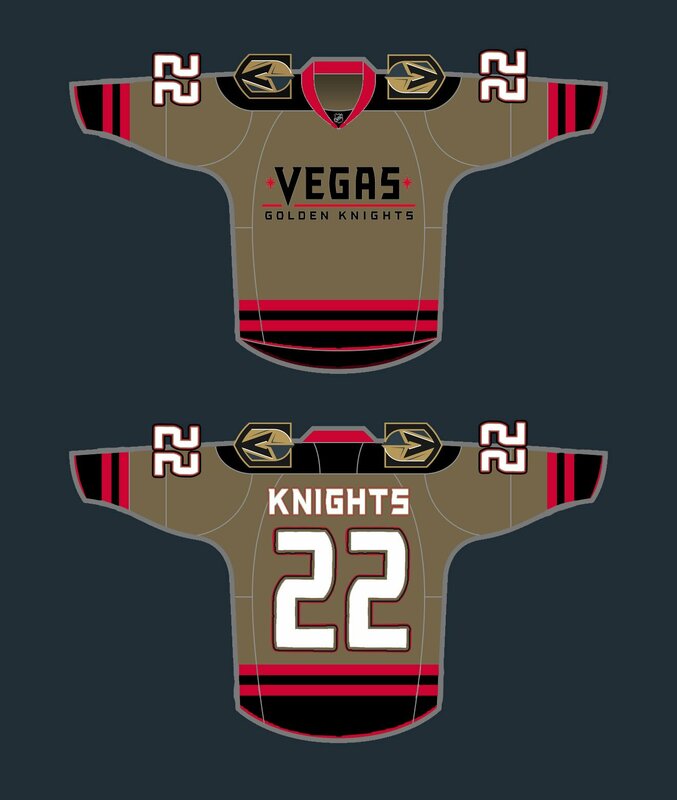 I hope Golden gets dropped sooner than later but with the awesome logos I can pretend the team name is just the Knights or better yet the Las Vegas Battle Born. Home and away are great. Gold not so much. The red alternate is probably my favorite. Love the Vegas Sword Star. Hoping they at least put it on a hat. Foley owns the trademark, not much Army can do. all in all though, i like the direction of these. Was really just to show what goes where more than trying to show a legitimate jersey. We could do it, but shoulder patches are basically invisible from the view we show the jerseys at. 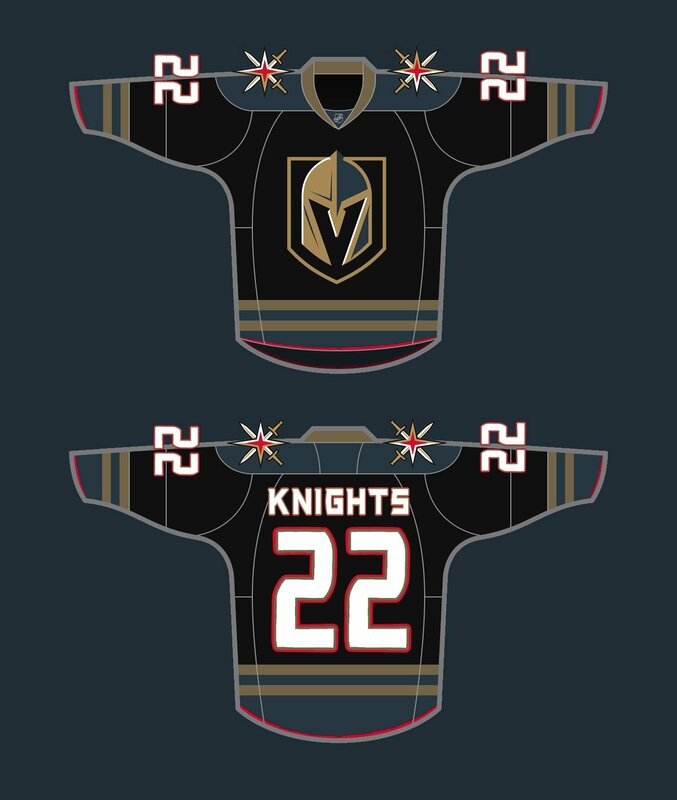 I don’t understand why the Golden Knights jersey is going to be steel gray. Don’t get me wrong, I love the color gray, it’s actually my favorite color. But shouldn’t the “Golden” Knights be Golden? Maybe if the helmets are gold that would help. I kinda wish we could distance ourselves from looking too much like L.A. I mean, they practically stole the shape of this shield that the logo is centered on. I like the main logo, but honestly I’d rather see them rock the secondary logo as the main logo just to distance ourselves from L.A. Too similar imo. I found a black shirt with the Vegas sword star logo at a sport store at the Galleria. 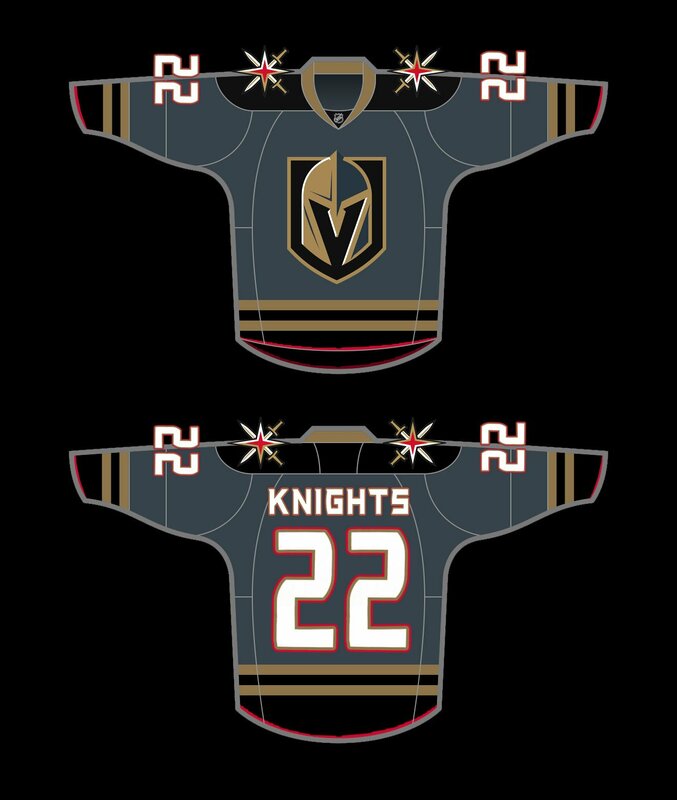 I wouldn’t mind it as our road jersey with the Vegas sign on the shoulders. Really liking the idea of a red jersey. Why does the road jersey have to be white? For one person out there that still has a black and white tv? Lakers do gold and forum blue Why can’t we be have a color jersey on the road? I love the first two jerseys. Not sure why, but I feel like the red line shouldn’t exist though, doesn’t fit with other colors in my opinion. I also like the red jersey, but it reminds me too much of the buffalo sabres somehow. So I’d rather see this logo on shoulders. I like the first 3 . The red reminds me of The Florida Panthers uniform they just got rid of before this season . The gold one , no thanks ! I designed the gold one, and I even hate it. Just wanted to see what it would look like using that color. Think we now know it’s a bad idea. Yipes! The gold one is the only one I like! And this my friend is why no matter what they do, they’ll never win. the first 2 would be a great set… especially with those colours and no team in the NHL ever used grey as their main colour. Love the content. Keep up the good work.